Gather a bunch of twigs, the straighter the better. Break or cut them an inch or two longer than the height of the jar. Wrap two rubber bands around the jar, one an inch from the top, the other an inch from the bottom. Cover the jar with the twigs, slipping them under the rubber bands. This is a little tricky, requiring some manual dexterity and patience, but older children shouldn't have a problem. The younger ones might need a little help. 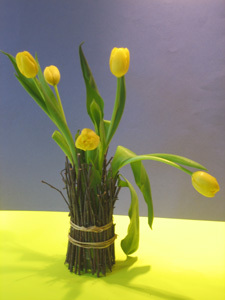 Cover the rubber bands with raffia or ribbon. Click to submit your COMMENTS/RATING.